Nora Sullivan, M.P.A | June 5, 2017. Issues in Law and Medicine is a peer-reviewed professional journal that has been published twice a year since 1985. It is currently cosponsored by the Watson Bowes Research Institute and the National Legal Center for the Medically Dependent & Disabled, Inc. 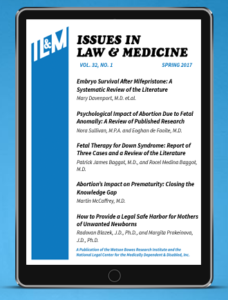 The new issue (spring 2017) includes a fine article by CLI associate scholar Nora Sullivan, M.P.A., cowritten with Dr. Eoghan de Faoite., an Irish physician committed to the sanctity of human life. This edition of the journal includes many other articles of current significance. We summarize them here. Further information about the journal and how to access current and past articles can be found at http://issuesinlawandmedicine.com/. We highly recommend ILM. The authors summarize data from 30 studies on the survival rates of embryos following the use of mifepristone (RU-486). This drug is the first of two taken in medical abortions. The researchers found that fewer than 25 percent of pregnancies continue after the use of mifepristone alone. With the advent of abortion pill reversal (APR) to counteract the effects of the drug on the embryo, this research provides a baseline for evaluating the impact of APR on saving life in its earliest stages. The authors analyze 10 medical research papers which documented the psychological impact on women who chose abortion following a prenatal diagnosis of a severe fetal anomaly. When a test reveals a life-limiting condition, many doctors advise women to terminate their pregnancies presuming that it will spare them great psychological trauma. Yet research shows that choosing abortion due to fetal abnormality puts mothers at higher risk of significant and lasting negative psychological impact, especially post-traumatic stress and depression. This review argues that women deserve adequate, accurate medical advice and options in these difficult circumstances, such as information on the psychological effects of abortion and the option of perinatal hospice. This review of three Down syndrome case studies reveals that brain development may be enhanced through educational and biochemical therapy before and directly after birth. The researchers suggest that early life offers a window of opportunity during which the effects of nutrition and education are amplified. They explore cases of children with Down syndrome who surpassed developmental expectations after they were treated with nutritional supplements and intellectual and physical stimulation. The author analyzes a wide range of research and offers a systematic summary of current medical literature which shows that suction abortion significantly increases women’s risk of future preterm births. Though the link between abortion and preterm births is the strongest causal relationship to be discovered, even stronger than smoking, McCaffrey discusses the absence of efforts to educate the public of these risks and the subsequent knowledge gap. Given abortion’s considerable impact on women’s future reproductive health, McCaffrey raises important questions of informed consent and women’s legal right to be informed of these risks when contemplating the abortion procedure or when viewing abortion as an option for future family planning. McCaffrey’s article concludes by considering the impact preterm births has on our nation’s healthcare system, the racial disparity, the lack of education, and offers legislative proposals to remedy these problems. Horror stories of newborn children being deposited in trash dumpsters, buried in junkyards, drowned in bathtubs, or locked in freezers and abandoned unto death circulate in the news from time to time. While such reports of neglect and abandonment outrage the public, the phenomenon of unwanted infants plagues societies worldwide. Many factors might influence a new mother to abandon or kill her child, and many of these same reasons lead pregnant mothers to seek abortion before their child is born. In this article, Blažek and Prokeinová seek to provoke more public discussion of another option—besides abortion or adoption—for mothers who feel unable to care for their child: the idea of baby hatches. The authors explore the legality of these baby boxes—which allow new mothers to drop their young infants in a supervised drop box anonymously, sparing women criminal liability for child abandonment and providing a pathway for abandoned and unwanted children to be placed in a nurturing environment. They analyze the current usage of this alternative in hopes of promoting more solutions for the global problem of unwanted babies.